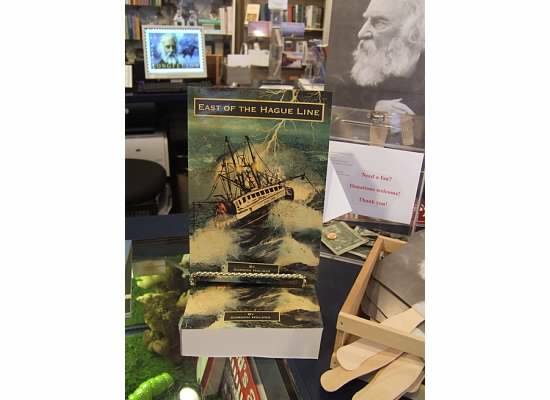 Last month Gordon Holmes came to the Long Island Learning Center to talk about, and read from, his new book, “East of the Hague Line,” a novel which “takes a close, personal look at what it takes to live the life of an offshore fisherman.” Given the enthusiasm of the crowd, it appears to be a great read, and a page turner, despite the over 600 pages. I still haven’t read it, but armed by the excitement I felt that evening at the reading, I set forth to spread the word amongst my fellow librarians in Maine, by way of the Me-Libs listserve. I also e-mailed our museum store manager, Melissa, and the library director, Nick. I’m pleased to say, that while the libraries still don’t seem to be jumping on board, the Maine Historical Society museum store now carries copies of the book – actually, they not only carry the book but feature it front and center, as you can see from this picture. And I just catalogued a copy for the Maine Historical Society Library.